SpotIE is Internet Explorer password recovery software. The program recovers forgotten passwords to web sites saved in Internet Explorer Web browser. Internet Explorer password recovery is a comprehensive solution for recovering all types of lost Internet Explorer passwords. Recovers AutoComplete Passwords: When you enter a Web site that contains a login form with username password, Internet Explorer may ask you if you want to save the password, after pressing the login button. If you choose to save the password, the password is saved as AutoComplete password. HTTP Authentication Passwords: Some Web sites allow the user to enter user and password in a separated dialog box. If you choose to save the password, the password is saved as HTTP authentication password. 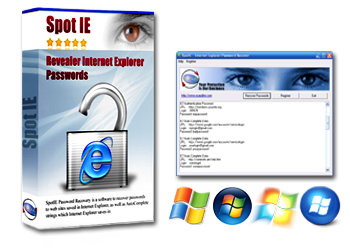 With SpotIE Internet Explorer password recovery software you can recover all types of Internet Explorer 7, Internet Explorer 8, Internet Explorer 9 passwords. It is the easiest to use Internet Explorer password recovery solution on the market.